Mayline's Mailflow Systems product line offers everything you need for your corporate mail center including sorters, tables, cabinets, carts and more. Optimize mail flow efficiencies while maximizing budget and supporting today's mailroom work flow and process. Built to support heavily loaded sorters or machines, Mayline Mailflow System tables are available in several styles and sizes. Storage Tables provide a large storage space (28" deep by 19" high) for immediate access to needed supplies such as bags, cartons, envelopes, etc. Available with locking doors to hide clutter and secure contents. 1 1/2" square, 16 gauge chrome legs adjust from 24" to 36" on 1" increments. Call Customer Service for other height ranges. For a stylish front edge, high pressure laminate or additional wire management capabilities available, please see below. Master key not available. Adjustable shelf kits are sold separately. Work Tables are functional yet economical. They support sorters or machines and are enclosed on three sides, making them convenient for storing carts or other large objects on the floor. For a stylish front edge or additional wire management capabilities. Pedestal Tables For SupervisorÍs Workstation, or for filing or storage at any workstation. Suspended pedestal, with one box and one file drawer, lock included. Field installed; can be mounted on either left or right side, or on both sides. 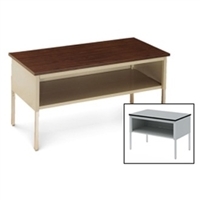 Pedestal measures 15 1/4"W x 21 3/4"D x 19 3/8"H.
Wrapping Tables are specially designed to accommodate either 24" or 36" paper rolls below the table top work surface. This keeps the entire top area clear for the wrapping and handling of packages. Tables for 24" paper rolls have a left side slot; tables for 36" paper rolls offer a rear slot. There is extra storage room for supplies inside all models. Optional sliding doors with locks. Storage Consoles are built to support heavily loaded sorters or machines, Mayline Mailflow Systems Consoles are available in several styles and sizes. Each console has full-height end panels with a 4" recessed toe space for a clean built-in look. Mayline Mailflow Consoles are built to support heavily loaded sorters or machines, they are available in several styles and sizes. Each console has full-height end panels with a 4" recessed toe space for a clean built-in look. Mayline Mailflow Consoles are built to support heavily loaded sorters or machines, they are available in several styles and sizes. Each console has full-height end panels with a 4" recessed toe space for a clean built-in look. 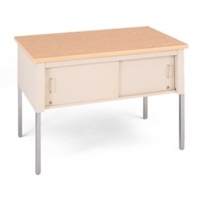 Storage Tables provide a large storage space (28" deep by 19" high) for immediate access to needed supplies such as bags, cartons, envelopes, etc. Available with locking doors to hide clutter and secure contents. 1 1/2" square, 16 gauge chrome legs adjust from 24" to 36" on 1" increments. Storage Tables provide a large storage space (28" deep by 19" high) for immediate access to needed supplies such as bags, cartons, envelopes, etc. Available with locking doors to hide clutter and secure contents. 1 1/2" square, 16 gauge chrome legs adjust from 24" to 36" on 1" increments. Mayline Mailflow Storage Consoles are built to support heavily loaded sorters or machines. They are available in several styles and sizes. Each console has full-height end panels with a 4" recessed toe space for a clean built-in look. Mayline Mailflow Storage Consoles are built to support heavily loaded sorters or machines. They are available in several styles and sizes. Each console has full-height end panels with a 4" recessed toe space for a clean built-in look. Mayline Mailflow Work Tables are functional yet economical. They support sorters or machines and are enclosed on three sides, making them convenient for storing carts or other large objects on the floor. Mayline Mailflow Work Tables are functional yet economical. They support sorters or machines and are enclosed on three sides, making them convenient for storing carts or other large objects on the floor. Mayline Mailflow Wrapping Tables are specially designed to accommodate either 24" or 36" paper rolls below the table top work surface. This keeps the entire top area clear for the wrapping and handling of packages. Tables for 24" paper rolls have a left side slot; tables for 36" paper rolls offer a rear slot. There is extra storage room for supplies inside all models. Optional sliding doors with locks. Mayline Mailflow Wrapping Tables are specially designed to accommodate either 24" or 36" paper rolls below the table top work surface. This keeps the entire top area clear for the wrapping and handling of packages. Tables for 24" paper rolls have a left side slot; tables for 36" paper rolls offer a rear slot. There is extra storage room for supplies inside all models. Optional sliding doors with locks. The Storage Tables provide a large storage space for immediate access to needed supplies such as bags, cartons, envelopes, etc. It is available with doors to hide the clutter and a lock if security is required. It does not have a shelf. It has 16.5 cubic feet of storage. It has 1 1/2" square, 16-gauge chrome legs that adjust from 24" to 36" on 1" increments. A master key is not available.